As project-manager-in-chief, JFK performed a miracle. He set a goal to achieve the greatest feat of exploration ever, led the team to complete it successfully and on time, but for three quarters of the project he was dead! While there was certainly a lot more going on behind the scenes, we can appreciate how JFK’s call to action 55 years ago (today!!) was just about perfect. Using the SMART-goal framework we can break down his short statement to see why it worked and how we can follow in his footsteps. Specific: If JFK had said, “Let us be the greatest space-faring nation on Earth” he might have inspired, but we wouldn’t have landed on the moon. Teams need specific goals so they know exactly where to start, and exactly where to end. The specificity of “landing a man on the moon and returning him safely to the Earth” doesn’t in any way constrain the team to a single solution, but it still defines the finish line unambiguously. Measurable: Buzz Aldrin punched a heckler in the face for claiming that he faked the moon landing. Based on the reaction from the internet, we universally agreed that Buzz was completely right to do this. We have no doubt because we all watched video of Buzz walk on the moon. He also brought back moon rocks (which were then stolen for illicit purposes). Building a reputation for your team requires objective proof that you’ve succeeded. Measurable doesn’t have to just be metrics, it might be moon rocks. Achievable: At the time, landing on the moon might have seemed achievable, but JFK had a lot going in his favor. He knew the moonshot was achievable because NASA had done a huge amount of validation down to the finest level of detail. He also had the ability to devote 5% of the GDP of the largest economy on Earth to the project. If your plan hasn’t been validated with at least one solution you’ll have no way to estimate the scope of work and resources necessary to complete it. We call that “landing” a plan, taking it from an abstract plan in the clouds to something that is firmly grounded in the details. Relevant: Scope creep is the project killer. 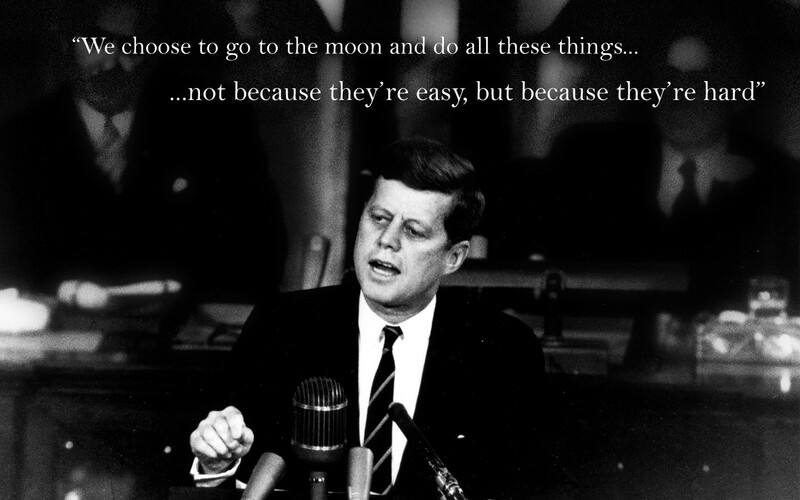 JFK kept his plan tight, all moon-based. No talk about colonies, or interstellar stuff, just moon. Time Bound: Many years ago a friend of mine started work at an actual flying-car company. He was so excited because they had been told that the billionaire backer of this flying car was so committed to the project that they were promised unlimited time and money to getting it done. As I suspected at the time, the flying car is still not finished many years later. Not setting a time box robs people of their ability to take risks. If you have something that needs to be finished today, you’ll try it out even though it has a small chance of failing. Setting the goal of a 1969 moon landing allowed the Apollo program to take risks. After the tragic deaths of the Apollo 1 crew, that deadline might have been the only thing that allowed NASA to continue to move forward at high speed. Bonus links! 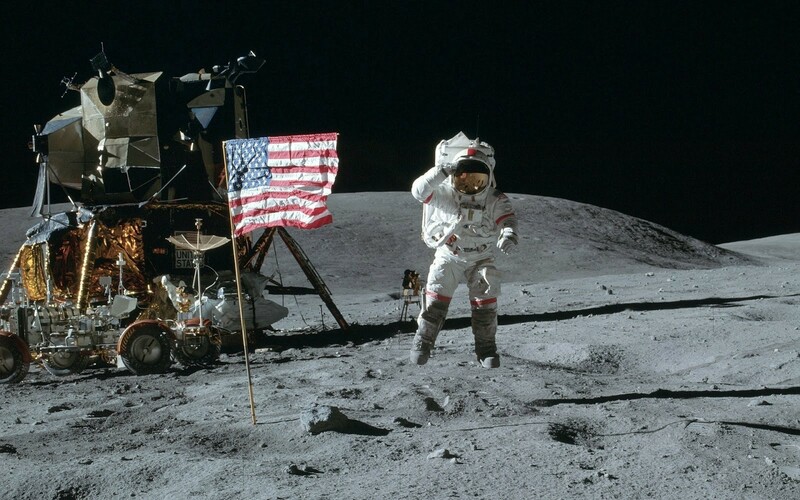 Julian Limon pointed out some great articles from business school: The Man on the Moon Standard and How John Kennedy Changed Decision Making for Us All.